Golf is a sport that is physically challenging and mentally stimulating. 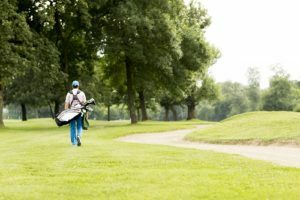 Although it is not a physically demanding type of game, one round will require you to move from one place to another, walking for several hours (if you are not using a cart). You also need to use your brain for the mental challenges that you are about to face. Golf offers several health benefits, according to several anecdotal and scientific sources. Let us discuss a few of the health advantages that golf has to offer. Physical exercises, regardless of what type it is, can encourage better blood circulation to your heart. Swinging the golf club, carrying your golf bag, and walking in the golf course can improve your blood flow and increase your heart rate. Your risk of diabetes and stroke are significantly lowered, and there could also be good effects on decreasing harmful cholesterol, especially when coupled with healthy lifestyle and diet. It has been found that a golf player’s heart rate can reach up to 100 beats per minute during an 18-hole round for a period of two to five hours. The memory circuits of your brain can be strengthened through routine daily walking. Alzheimer’s Society’s director of research, Clive Ballard, said that being physically active can keep your brain and heart healthy. It also improves blood circulation to the brain, which is crucial in its overall function and efficiency. You need 10,000 steps per day if you wish to lose weight. You can easily reach and even exceed this recommended figure with an 18-hole round especially if you walk instead of using a golf cart. Recent studies in Japan, Norway, Germany, Sweden, and the US showed that a male golf player can burn up to 2,500 calories throughout an 18-hole round while female golf players can burn up to 1,500 calories. Being able to walk in fresh air, socializing with other golf players, and the additional mental challenge stimulates the release of endorphins, which are chemicals in your brain that aids in the enhancement of your mood. Endorphins can help you feel more relaxed and happier. Fresh air and exercise are two important factors when it comes to having a good night’s sleep. Walking the Myrtle Beach golf course is an excellent form of workout. Exercising regularly can help you sleep faster and also aid in keeping you in deep sleep much longer. Additionally, a good quality sleep can help you repair and relax your muscles. If you are looking for a low impact sport then golf should be the first one on your list. Mature players go for golf because they can easily burn calories without having to worry about getting injured while playing. A study conducted by the Karolinska Institutet, spearheaded by Professor Anders Ahlbom, revealed that golf players have a 40 percent lower death, which is equivalent to an increase of five years in their life expectancy. Using golf carts is common and it is very easy to simply ride one rather than go on a stroll. Although these vehicles are quite useful especially for the elderly and those with disabilities, you can still enjoy a good game of golf and exercise at the same time if you walk instead. If possible, play golf without using a golf cart, if you want to enjoy the health rewards of playing the sport. As you can see, golf offers several health benefits and the ones listed above are only a few of the advantages that golfers get to enjoy. The sport may even have a much broader and greater effect on our well being than we initially thought. Fall is a great time to enjoy the fresh air and play a round of golf in Myrtle Beach. Now is the time to book a golf package for a weekend or an entire week. The beach crowd has left town and the weather is superb. Call Myrtle Beach Golf Directors for golf package specials, golf courses, tee times, and more.